Since this past Sunday, aka Daylight saving time, I’ve been craving summer-y dishes like strawberry ice cream and peach pie. Yes, we’re only in the middle of March, but the moment it stays lighter later and we get to enjoy sunshine for a couple more hours, my mind immediately goes into summer mode. I know that I don’t live in an area where there will be winter-y weather for about 1-2 more months, but after record low temperatures and rainfall in Southern California, I’ve never been more excited for warmer weather. On top of beautiful weather, we’ve been enjoying wildflower super blooms as well as the annual migration of butterflies from Mexico to the Pacific Northwest (the painted ladies). Walking outside and seeing hundreds upon hundreds of butterflies is quite honestly one of the most beautiful sights and it’s amazing to see how it’s positively affecting everyone’s mood. I sometimes forget how lucky I am to live in such a awe-inspiring area and I’m trying to take full advantage of my surroundings. More hikes are in my future! So, today I wanted to work with a produce that is best in the summertime, but can actually be utilized all year long. Blueberries. Even though blueberries are at their peak in California from May to July/August, I eat them every single day with my breakfast. Blueberry is the one fruit that I just can’t seem to enjoy for a limited amount of months; I’d rather have a mediocre blueberry than no blueberry at all. 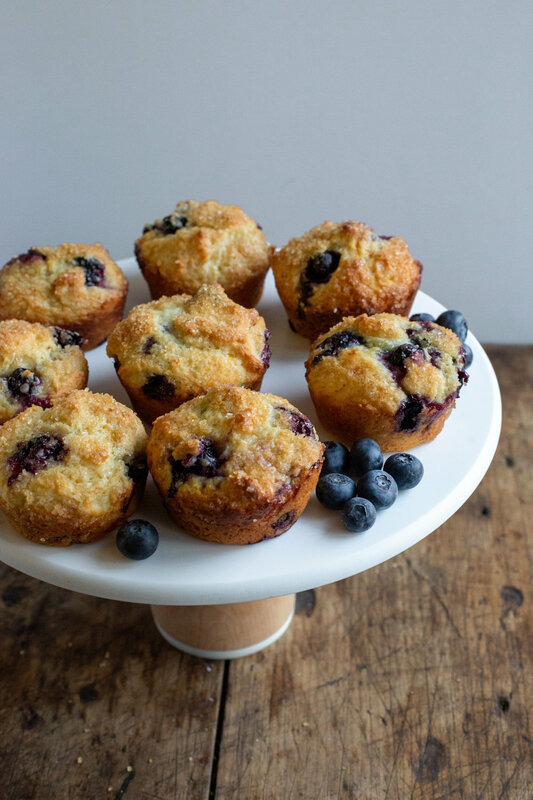 When it comes to blueberries in dishes, I’ve always been a major fan of perfectly simple blueberry muffins. The recipe I’m giving you today is that and so much more. I really wanted to use wild blueberries for this recipe because I find that they’re SO delicious and bursting with flavor, but since it’s still wintertime, the only wild blueberries available are frozen. I attempted to use the frozen wild blueberries that I found at Trader Joe’s but they completely stained my dough - literally, I was left with blue muffins. Although the flavor was still there, I couldn’t accept the color and decided to go with plain fresh blueberries. My advice is using fresh berries is much easier even though berries aren’t at their peak of ripeness at the moment. I promise that the berries that I bought at the grocery store still made the muffins amazing, and just think how much better it’ll turn out when you make these again in the summertime. Below in the recipe, I give the optional step to make an easy glaze for the muffins. The glaze, which is simply confectioners’ sugar and fresh lemon juice whisked together, is optional because I personally think the muffins are perfect as is, especially since there’s the crunchy topping, thanks to a heavy sprinkling of turbinado sugar. But, I did make a couple of batches with the glaze and the few people I gave them to went crazy over it and thought it was mandatory that I include it in this post. So whether you’re a muffin purist like me or if you fall into the category of “more is more”, you have the option to glaze or not. Glaze half of the batch if you want! Preheat the oven to 425°F. Grease a 12-count muffin tin with cooking spray or butter, or line with cupcakes wrappers. In a large bowl, using your hands or a whisk, massage/mix the granulated sugar and lemon zest together until fragrant (this helps release the oils in the zest). Add the melted butter, sour cream/yogurt and egg, and whisk until well incorporated. Using a spatula, carefully fold in the flour and blueberries until you can no longer see any dry ingredients. Do not over mix! Using a spoon or an ice cream scoop, fill each muffin cavity to the brim with batter. Evenly sprinkle a heaping 1/2 tsp. of turbinado sugar over each muffin. Bake for 5 minutes at 425°F, and then turn the oven down to 350°F and bake for another 18-20 minutes, or until a toothpick inserted in the center comes out clean. The blast of initial heat helps the muffins get their height. Allow the muffins to cool in the pan for a couple of minutes before taking them out. Drizzle each muffin with the lemon glaze (optional, recipe below). Muffins are best eaten on the day they are baked, but can be enjoyed for 1-2 days after if covered and left at room temperature. In a small bowl, combine the confectioners’ sugar and the fresh lemon juice with a whisk. Start with 3 tbsp. of fresh lemon juice, and add more only to reach your desired consistency. Before leaving for our trip to Maine last week, I felt like I was in dire need of a break from baking. I kind of felt like I was in a rut and I just wasn’t feeling that inspired - it happens every now and then, and it’s perfectly normal. I’m happy to report that the trip completely helped me out of my slump mostly due to all the incredible and creative pastries/baked goods I consumed over the few days that we were there. Even though I ate healthy for a few days when we returned home (did you see my guide and how much we ate?! ), I was SO excited to get back to baking this past weekend. If you read my Portland city guide, you may have noticed that I recommended a lot of bakeries and cafes, but it wasn't only at these incredible spots where I found my inspiration. One of the mornings, we trekked to the Deering Oaks Park farmers market and perused what Maine had to offer in terms of fresh produce, flowers, dairy products, etc. At one of the numerous booths, they had samples of different fall-flavored baked goods, including sweet potato chocolate chip muffins - a kind of muffin I didn’t even know existed. Alex and I both took a (big) piece and fell absolutely in love with them; as much love as you can with a baked good. I turned to him and said “I can’t wait to go home and figure out how to replicate these”. So, I did exactly that. I returned home and tested out a couple of different recipes until settling on what I thought came as close to the farmers market version. In one batter, I used olive oil while in another I used vegetable oil. In another batch, I roughly chopped up dark chocolate into misshapen pieces, while in another I used semi-sweet chocolate chips. In the end, the winner to me was the combination of semi-sweet chocolate chips and vegetable oil, although if you’d prefer to use olive oil, there wasn’t that huge of a difference in flavor. Another aspect of this recipe worth noting is that there are two flours being used: regular all-purpose flour and white whole wheat flour, a flour you can easily find at any grocery store. With the addition of half a cup of white whole wheat flour, you’ll get a bit more nutrition and in terms of flavor, the muffins will take on a subtle nuttiness - nothing overpowering though. I noticed that most of the sweet potato muffin recipes that I came across online used only a type of whole wheat flour, mainly to yield “healthy” muffins, but today my goal was to recreate the ones I had in Maine, and in the end, the blend of flours came out on top. Note: whole wheat flour is perfectly acceptable in place of white whole wheat flour. I’m sure you’re wondering a couple of things regarding the sweet potato aspect of these muffins: 1) do the muffins taste savory because of it? and 2) how do I prepare the sweet potatoes? For the former question, these absolutely do not taste savory, and I suppose the best comparison would be to desserts that use pumpkin. Like pumpkin, sweet potatoes have a mild sweetness that works beautifully when used in baked goods and other desserts. In the end, you’ll end up with a hint of sweet potato, but mostly you’ll just be enjoying an incredibly moist muffin with cozy fall flavors and a healthy portion of chocolate chips. As for the latter question, you’ll have to put a little more effort in for these muffins because it requires you to bake the sweet potatoes before even getting to the muffin batter. Just like making a baked potato, you’ll have to roast the sweet potatoes for about 45 min. to an hour, allow them to cool, and then scoop out the interior, no skin included. You only need 1 cup of “mashed” sweet potato, but I would recommend baking 2 medium sweet potatoes just in case. I strongly recommend topping each muffin with additional chocolate chips before popping them in the oven. This makes the muffins look more bakery-style, aka more appealing to the eye and honestly, there’s nothing wrong with more chocolate. Lastly and most importantly**, pay attention to the oven temperatures (yes, plural) given in the recipe, because this will aide you in getting that lovely domed muffin top that we all enj0y to eat. Roast the sweet potatoes: Preheat the oven to 400 degrees F. Wash the potatoes and pat dry with a paper towel. With a fork, poke holes all over the potatoes. Wrap tightly in aluminum foil, place on a baking sheet, and bake in the oven for about 45 minutes, or until fork tender. Unwrap the potatoes from the foil, and allow them to cool for about 10 minutes before slicing open and spooning out 80z. (1 cup) worth of sweet potato. Mash with a fork and set aside. You’ll most likely have extra. Raise the oven temperature to 425°F. Line the muffin tin with liners or coat each muffin cavity generously with nonstick cooking spray. In a large bowl, whisk together the eggs, sugar, mashed sweet potato, milk, and oil. In a separate bowl, whisk the two flours, baking soda, baking powder, cinnamon, and salt. Add this to the wet ingredients and mix until just combined. With a spatula, fold in the chocolate chips. Using an ice cream or cookie scoop, fill each muffin cavity almost to the top. Sprinkle 5-6 chocolate chips on the top of each muffin. Bake in the oven at 425°F for 5 minutes, then lower the oven to 350°F, and bake for an additional 15-17 minutes. The muffins are done when the tops are lightly browned and a toothpick inserted in the center of the muffin comes out clean. Allow the muffins to cool in the pan for 5 minutes before transferring to a wire rack. Enjoy warm, or the next day! I've gotta be honest and say that these weren't the muffins I was intending on giving you today. My plan was to make my favorite muffins but silly me forgot that the main ingredient of that kind is only available in grocery stores from about October to December. Any idea as to what I could be hinting at? CRANBERRIES! I really wanted to share my cranberry orange muffins (or scones!) with you, but I forgot that fresh cranberries come and go so quickly. Smart people very wisely save and freeze cranberries for when a craving occurs in the middle of the year, but I am not one of those people apparently! Also, even though fresh cranberries are obviously the way to go, I just realized that Sprouts, a grocery store with an amazing bakery and home to some delicious cranberry muffins, actually uses dried cranberries in their recipe. So maybe I'll try using dried next time and see if they are just as good as muffins with fresh cranberries. But I digress. 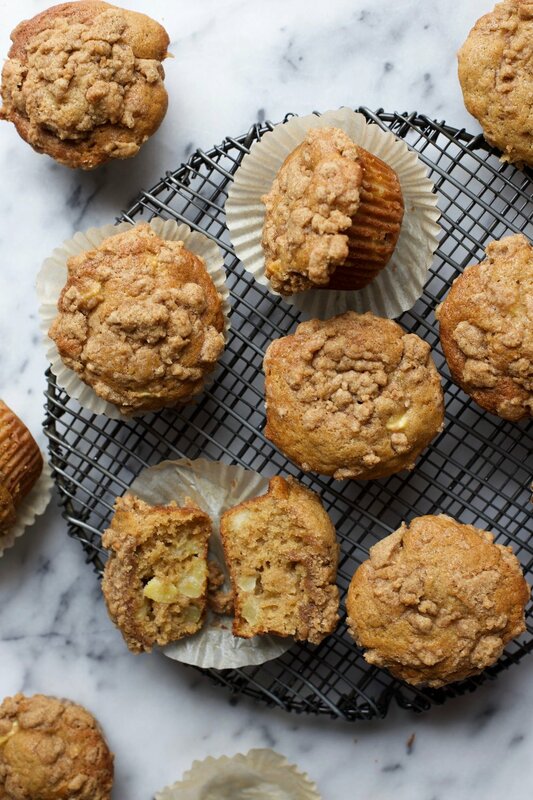 Today I offer you another great muffin option: apple crumb muffins. And yes I know that apples are usually favored in autumn when the leaves are falling and Thanksgiving is right around the corner, but I like to enjoy apples all year round. Don't we all? These muffins are perfectly moist from the addition of any yogurt of your choosing (Greek, plain, flavored - I used nonfat plain Greek yogurt) or can be substituted with sour cream. 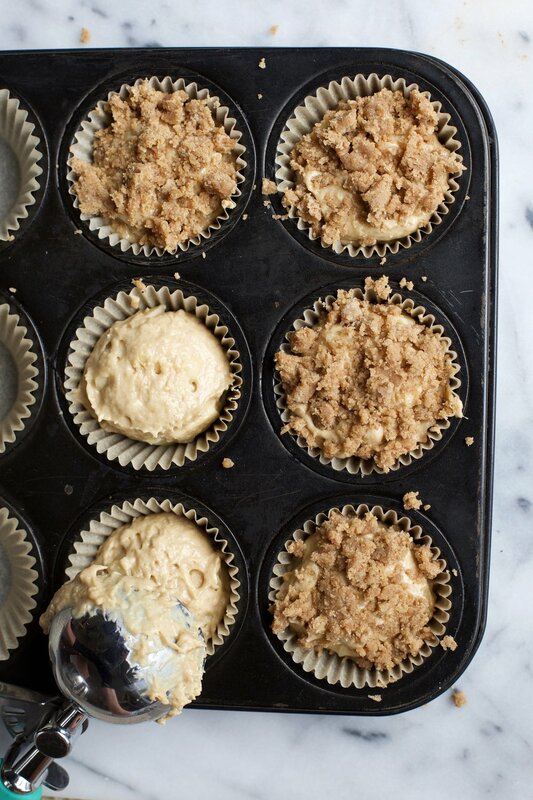 And everyone knows that the best part of any muffin is the top, and this recipe in particular takes it up a notch with a crumb/streusel topping. I won't judge you if you make a batch of these and just eat the muffin tops... it's your life, and I may or may not do the exact same thing. Enjoy these muffins with your coffee first thing in the morning, and know that within time, I will be gifting you with cranberry orange muffins. Make the crumb/streusel topping. In a small bowl, mix together the melted butter, both sugars, and cinnamon. Fold in the flour with a spatula until incorporated. Set bowl aside. Preheat oven to 425°F. Grease a 12-count muffin tin with cooking spray or butter, or line with cupcakes wrappers. Depending on the size of your muffins, you may need to make the muffins in batches. 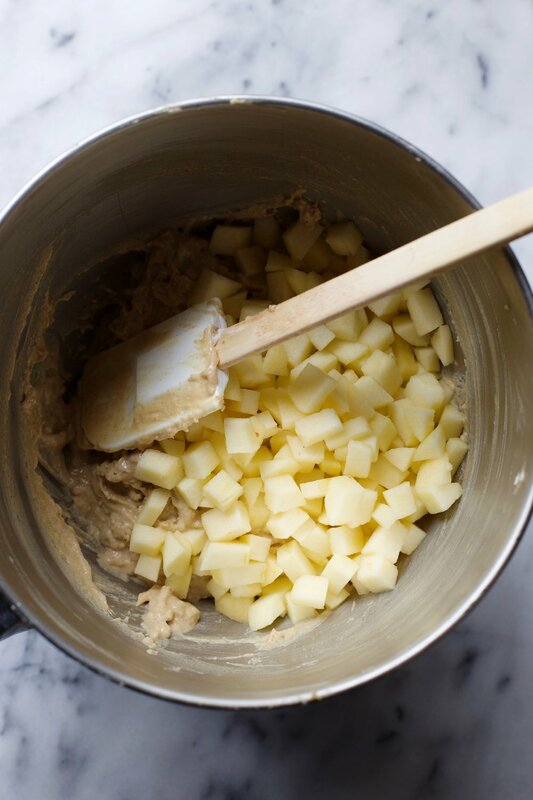 With a hand mixer or in the bowl of a stand mixer fixed with the paddle attachment, cream the butter and both sugars until fluffy, a couple of minutes. Scrape down the sides of the bowl. Add the eggs, one at a time, allowing each to incorporate before adding the next. Add the vanilla extract and yogurt (or sour cream), and mix until combined. Scrape sides of bowl again. In a separate bowl, whisk the flour, baking soda, baking powder, cinnamon, and salt together. Add this mixture to the wet ingredients, along with the milk and mix on low until just incorporated. Fold in the chopped apples. Using a spoon or an ice cream scoop, fill each muffin cavity to the brim with batter. Sprinkle the crumb mixture over the top of each muffin, making sure to press down on the crumbs so they will stick while baking. Bake for 5 minutes at 425°F, and then turn the oven down to 350°F and bake for another 15-17 minutes, or until a toothpick inserted in the center comes out clean. The blast of initial heat helps the muffins get their height. Allow the muffins to cool in the pan for a couple of minutes before taking them out. Muffins are best eaten on the day they are baked, but can be enjoyed for 1-2 days after if covered and left at room temperature.